When blogging first became popular a few years ago, I signed up at blogspot.com and began a blog. It survived a total of only one entry. With that in mind, I avoiding the realm of blogging because I knew that I would not be disciplined enough to consistently update the blog with fresh and interesting posts. As those of you who follow this blog have been quick to point out, I have proven this fear to be well founded. My apologies for the delay in posting. We have been extremely busy here in Siem Reap and the surrounding area due to the flooding caused by Typhoon Ketsana, the holiday and festival season here in Cambodia, and the daily educational efforts which go on in our busy household. The orphanage at Stoung is doing well. We have increased the number of children by 4 to a new total of 18 students. The consequent increase in expenses has raised the need for additional donations to keep the work going. I would encourage each of you to visit the revised and expanded PRM website http://purereligionministries.com to view the current budget information. 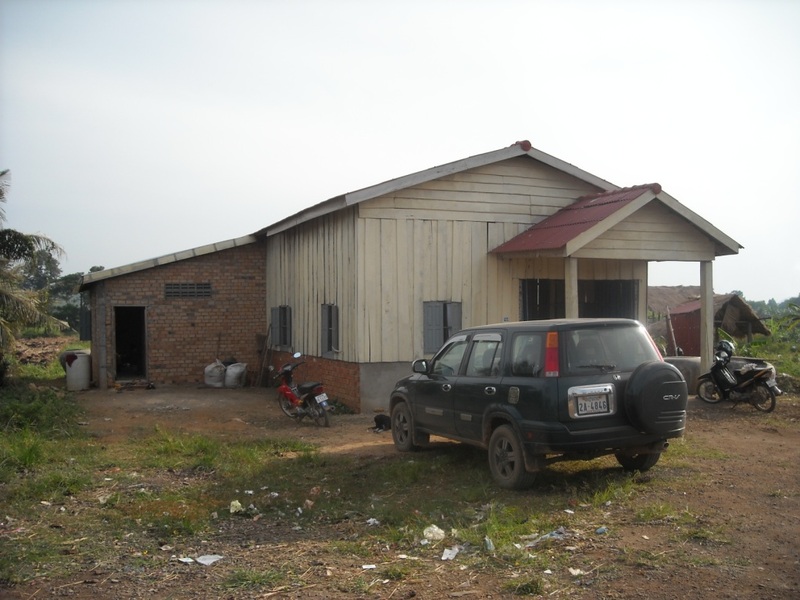 Additionally, we hope to purchase land before the end of 2009 on which to build permanent facilities for the PRM Orphanage. Pray for the planning and fruition of these efforts. If all goes as planned, it will make for a very busy year in 2010. Due to the increased interest here in Siem Reap, we have made the decision to begin hosting a Sunday morning worship service in our home. We will host our first meeting tomorrow morning, November 1, 2009. Please pray that as the weeks go by more people from our neighborhood will manifest an interest in our worship and teaching ministry. We are looking forward to having our friends Sokhom and Mi along with their children and extended family with us tomorrow. We had hoped to have Brother Jeyakumar Anugraham and his wife Alice with us, but unfortunately, Jeya suffered a heart attack on Thursday evening and had to be transported to Bangkok for some related medical procedures. Please continue in prayer for him as he recuperates and receives ongoing treatment. I do want to thank you all again for your continued interest in the goings on of Weyel World, and will attempt greater dilligence in reporting to you through this medium. We are so thankful to have had the blessing of a visit from Brother Lyle Tomlinson of Cincinnati Primitive Baptist Church. Brother Lyle was in the region (Southeast Asia) conducting business meetings and was kind enough to schedule a few days for us. With some advance notice we were able to provide a list of needs and even schedule some items to be delivered to the Tomlinson’s for Lyle to bring with him when he came. These items will be a great help to us in our continued efforts at gluten free cooking as well as in ministering to the saints here. Most of all, we are thankful for Brother Lyle’s interest in our effort here and desire to be a part of what we are attempting to do. During his time with us, Brother Lyle was able to witness a youth soccer game, visit the local market and grocery stores, visit the orphanage for worship on Sunday morning and the facility at Varin on Monday morning. We also were blessed to be a part of the 3rd anniversary celebration of the Christian Fellowship of Siem Reap where we were able to introduce Brother Lyle to some of our new friends among the Christian community here in our town. 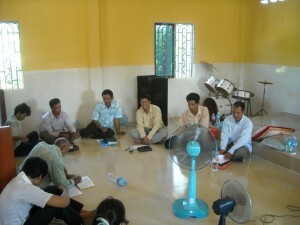 We are encouraged whenever our friends and loved ones are able to come and visit us here in Cambodia and hope that many more will be able to experience first hand the blessing of serving the needs of Christ’s people in this land as well as to witness the specific efforts that we are engaged in. We want to express our deep thanks and appreciation to Brother Lyle and Sister Leanna Tomlinson as well as Elders Bradley, Huffman and all of the members of Cincinnati Church for their encouragment and prayerful support for our family in this time of our lives. Elder Jamey Tucker and I were first introduced to Chuob Sopheap in November 2007 at our conference in Phnom Penh. We both remembered him as very intent on the lessons that we taught, and he seemed to have a good deal of understanding of the Bible and the message of Sovereign Grace. We again met him during our teaching in October 2008 at the training session near Siem Reap. At that time, Brother Sopheap, along with 13 other church leaders, expressed his belief in Primitive Baptist doctrine and his desire to reset his ministry and church experience based upon his new understanding. He was baptized in the West Baray near Siem Reap on October 1, 2008. Rachel and I were blessed to finally visit Pailin City in January 2009, and met in Sopheap’s home at that time. We were with the ministers and members for only one day and a half, but in that time, they each became very special to us and I have looked forward to resuming ministry in their community. After our return from Bangkok and release from quarantine, Dara and I were finally able to schedule a visit to Pailin on August 12-14. The scheduled services began on Thursday morning and concluded on Friday at 12 noon. My text for Thursday morning’s introductory message was John 5:39“Search the scriptures; for in them ye think ye have eteranl life; and they are they which testify of me” coupled with Luke 24:25-27 “Then he said unto them, O fools, and slow of heart to believe all that the prophets have spoken: Ought not Christ to have suffered these things, and to enter into his glory? And beginning at Moses and all the prophets, he expounded unto them in all the scriptures the things concerning himself.” I attempted to show how Jesus Christ is the subject of the entire Bible, both Old and New Testaments. It is important for us as Christians, and particularly as ministers of the word, to search the Old Testament scripture as well as the New, in order to have a full understanding of all that God has revealed to us of himself. In subsequent messages I attempted to present the Old Testament types, figures, promises and prophecy of Christ as found in the accounts of Adam and Eve, Abraham, Joseph, Moses, Isaiah 53 and Psalm 22. Friday morning, I preached for more than 2 hours on the qualifications and responsibilities of the Pastor and Teacher. The congregation remained very alert and attentive, and seemed to express genuine conviction and understanding of the gravity of the responsibilities being addressed. The final message was an overview of Old Testament prophecy, eschatology and prophetic interpretation (sorry, the digital recorder malfunctioned so this message is lost to posterity). 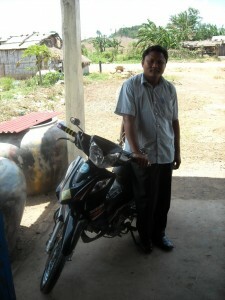 Brother Sopheap with his new motorbike. We were also blessed with the ability to purchase a used Suzuki motorbike for Brother Sopheap to enable him to better travel and preach the gospel in his area. Please pray for God’s blessings on the 14 congregations that were represented at this meeting and for their leaders as they study God’s word and continue to grow in knowledge and understanding. Elder Shafer visits with the children after worship. 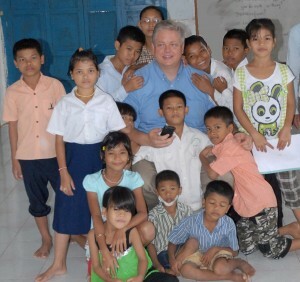 Upon our return from Bangkok, Elder C. Dwayne Shafer and I were blessed with an opportunity to travel to Stoung to worship with Brother Hen Candara and the children of the Pure Religion Orphanage. I was thankful that Elder Shafer was able to join me for this service and appreciated the message that he brought from the experience of Jonah. The children enjoyed meeting him and rejoiced in his testimony of God’s grace and mercy. During the week that he spent with us in Siem Reap, Elder Shafer was unable to be out of the house much at all due to the extreme back pain that he suffers from. I am thankful for his willingness to travel this far to be with us during our trial with Beth and for the opportunity to introduce him to our ministry and some of the people whom God has made so dear to our hearts. Please pray for Elder Shafer as he continues to deal with the many challenges that his disability presents in his life. That joke didn’t seem nearly as funny after we were in Bangkok for Beth’s treatment and noticed signs on the hospital walls warning of cases of H1N1 being treated in their facility. However, we took all precautions that we thought necessary to avoid exposure and after Beth was released from the hospital we returned here to Siem Reap. Two days after our return, Rachel began to experience an extremely high fever and body aches which was followed shortly by a sick stomach. In typical SuperMommy fashion, she didn’t complain and continued caring for everyone else in our home including our four children, Joseph and Elder Dwayne Shafer (who stayed with us for about a week after our return). By Sunday afternoon it was clear that Rachel was not getting better, and Emily and Beth were also beginning to experience symptoms. After Brother Dwayne’s departure on Monday morning, we began to seriously discuss another trip to the hospital. Joseph had already scheduled a visit from Brother Dara and two other ministers and thier wives for Wednesday, and they were planning on arriving in Siem Reap on Tuesday evening, so we decided to move Rachel and the children to a hotel room with air conditioning for the night. By Wednesday afternoon, Dr. 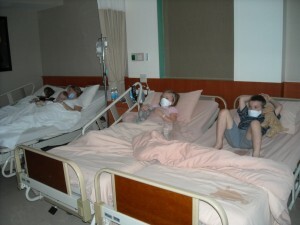 Mom (Rachel) had determined that the symptoms all pointed to a very serious case of influenza and had called the Royal Angkor Hospital to prepare them for an evening admission. Joseph arranged for our company to return home and he joined the family at the hospital on Wednesday night. After considerable poking prodding and culturing, Rachel, Beth, Emily, and William were all diagnosed with a Type A strain of the flu. The samples were dispatched to Phnom Penh for confirmation of the suspected H1N1 strain. Jeremiah and Joseph were both immediately given a course of Tamiflu. Rachel had developed pneumonia in both lungs by this time and was in for a long recovery period. Our entire family remained hospitalized for a total of 5 days after which we were remanded to a home quarantine for another 4 days. During this time, we were especially thankful for the kind assistance of the staff at Royal Angkor Hospital, the Doctors of the Cambodia Ministry of Health (in cooperation with the World Health Organization) and the staff at the United States Embassy in Phnom Penh. We are also ever thankful to each of our friends and loved ones in the USnA who have devoted their time to praying for our health and efforts over here. We are thankful to report that since our recovery almost 9 weeks ago we have been spared any significant or lastng illnesses which has finally opened the door for us to begin actively ministering to others. To begin, I want to apologize for our failure to post any blog updates for the past two months. We have been very busy and consequently much has happened that we need to update all of our prayer partners on. This will be the first of several blog updates in the next few days. I am going to attempt to organize the updates both chronologically and by area of labor. We have been blessed beyond measure as God has allowed one difficulty after another to be cleared up and we have gradually been allowed to adapt to our new surroundings. The issues with electrical power, internet connectivity, and non-functioning appliances have been resolved to a limited degree, and we have also been blessed with a new used vehicle with which we are able travel about the country. As far as the overall work has gone, we have continued to pursue our plan to make occassional trips to area churches and ministers meetings to introduce and build upon the foundation of God’s sovereignty in salvation and the sole sufficiency of the scriptures for both faith and practice. In the meantime, we have continued to work to make friends and establish opportunities for ministry here in Siem Reap as we grow more familiar with the community, the culture, and the language. We were recently blessed to enjoy a visit from Joseph’s mother and father from Texas which served to lift all of our spirits and encourage us on our way. In the subsequent posts we will attempt to provide some insight into each of the areas of our labor and some of the individuals with whom we have been worshipping and working. We are so grateful for the thousands of prayers that have gone up on behalf of our family and our daughter Beth during the past few days. We have received encouraging notes and prayers through e-mail, Facebook, listservers, and even personal visits at the hospital here in Bangkok. It would be impossible for us to adequately thank each individual for their efforts on our behalf, but our thanksgiving remains. We are are also thankful for the doctors, nurses, and technicians here who have assisted in Beth’s care and diagnosis. Our greatest thanksgiving and praise, is of course reserved for God Himself, who is the Great Physician, Jehovah Rapha. We do not now know all that has contributed to the events of the past few weeks, nor can we know for certain the exact causes of each of Beth’s symptoms. We do know that our God is over all, and it was His purpose to allow Beth to be sick, and also to heal her by His grace. We are deeply saddened by her remaining diagnoses, yet thankful for the knowledge of the conditions and the wisdom to be able to live with them. In the course of the past few days, much information has been disseminated regarding our family, Beth, and the health problems that she was experiencing. Along with the information, it has also come to our attention that mis-information was also spread by well meaning friends. In an effort to clarify the record and to honor God by an accurate accounting of His work, we are providing the following as a brief timeline and summary of our experience with Beth. 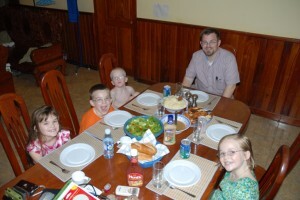 May 29, 2009 – Our family arrived in Cambodia and travelled to our home in Siem Reap. June 2, 2009 – Rachel, Beth, Emily, and William each contracted a bacterial or viral stomach infection lasting three days. They each recovered from all of the symptoms of this infection. June 5, 2009 – Beth began complaining of a pain in her abdomen just to the right of her belly button. The pain increased dramatically over the next two days. June 7, 2009 – We visited Royal Angkor Hospital in Siem Reap for the first time. The Dr suspected appendicitis and ordered an abdmoninal CT scan which was inconclusive. Beth was admitted for overnight observation and IV fluids/antibiotics. She was released with a week’s supply of anti-biotics and other meds. June 16, 2009 – Beth’s pain continued to increase inspite of continuing antibiotics. A return visit to Royal Angkor for bloodwork and urinalysis revealed evidence of infection prompting an additional course of antibiotics. June 19, 2009 – A second CT scan was ordered again yeilding little helpful information. At this time a number of items led us to suggest the possibility of increased blood glucose levels. June 23, 2009 – Fasting bloodwork revealed an elevated blood glucose level (138) and other indications causing concern about diabetes. June 25, 2009 – We travelled to Phnom Penh for a consultation with a pediatrician at Royal Rattanak hospital. She confirmed that Beth’s pain was real, and that it warranted further investigation. She referred us to Bangkok Hospital and scheduled an appointment for June 27. June 27, 2009 – Beth was admitted to Bangkok Hospital, where her HgA1C was checked to confirm diabetes. Additional blood work was ordered and a number of examinations were undertaken in an effort to deal with her abdominal pain. June 29, 2009 – We transferred Beth to Bumrungrad International Hospital to continue her testing and diabetes education. On the evening of this day, she began to report pain and increasing numbness in her legs as well as "lavendar spots" in her field of vision. The painful spot in her belly was continuing to become worse. June 30, 2009 – Blood tests revealed a probable diagnosis of Celiac Disease. July 1, 2009 – Her pain continued to increase, and her legs became completely numb. She was unable to stand or walk, and could not hold herself in a sitting position in her bed. Also, the lavendar spots had changed to yellow, and had completely obstructed her vision from her left eye. A neurologist was consulted, and his immediate suspicion was a condition known as ADEM. It was at this point that we published a general request for prayer for our daughter. I cannot begin to express to you the degree of fear and concern that we experienced that evening as we realized that our daughter could not walk or see. We spent the entire evening in prayer as we awaited an MRI brain scan in the morning. Brother Dwayne Shafer, who is an experienced medical doctor, made the generous offer to come and be with us and to help evaluate the diagnosis and treatment and immediately boarded a plane to meet us. July 2, 2009 – Began as Beth’s worst day to date. She awoke in agonizing pain and could not even hold herself up in the wheelchair as she was taken down for the MRI. Many have expressed that they were in prayer for Beth at the time of this procedure, and some have expressed that a certain peace came upon them in answer to prayers at that specific time. The MRI results came back negative, and failed to confirm any diagnosis. About two hours after the procedure, Beth was able to stand and walk for about 15 minutes before collapsing back to her previous state. This momentary ability caused an amazing amount of joy and gave her the first hopeful sign in some time. Later in the day, the spots in her vision began to clear, and an eye exam revealed no detectable damage to her optic nerve. July 3, 2009 – Elder / Dr Shafer arrived at the hospital around mid-morning to find Beth walking around and waiting for him him the elevator lobby. Her neurological symptoms continued to subside throughout the day, and by Saturday morning, the only remaining symptom was the pain in her stomach. July 4, 2009 – Beth was released from the hospital and allowed to return to the hotel with the rest of our family. We are scheduled for a follow-up appointment on July 6, and will then return home to Siem Reap. This morning, we were blessed to attend a worship service with Calvary Baptist Church here in Bangkok where the message was on the lesson of the Syrophenician woman. "yet the dogs under the table eat of the children’s crumbs." I was made to realize once again what a blessing it is to be recipients of even the least of His mercies. It was a great blessing for our family to be together once again in a worship service. We wish to extend our special thanks to Elder Dwayne and Sister Kathy Shafer, Dr. Jefferson Harris, Rebecca Case (Rachel’s sister), Fred Bourg (Joseph’s uncle), and to my parents Carl and Connie Weyel, without whom we would not have been able to make it through the past few weeks. We are thankful also to numerous others whose kind encouraging words, offers of help, and continuing prayer have focused our minds and attention on the goodness of God in our lives. As we look forward to the days, months, and years ahead, it is with a renewed commitment to God and His will in our lives. I (Joseph) am convicted of my sin and disobedience in failing to manage my diabetes and the wreckless manner in which I have endangered my life through selfish eating and failure to test and monitor my blood sugars. Seeing Beth now facing a lifetime of the same challenge and responsibility causes me to reflect seriously upon the poor example that I have been and the responsibility that I have to maintain a positive example for my children. It may be some time before we understand all that God intends for us to learn from this experience, and it may be that we are not finished with the experience itself as we still do not understand the cause of Beth’s symptoms. However, we can begin tomorrow living in the light that He has given us today. The challenge of life in Cambodia is still ahead of us. There is still much work to be done, and many trials of our faith left to endure, but the Author of our faith remains strong in our defense, and continues to speed us onward. Please continue in your prayers for us, and remember the needs that we have already mentioned in previous posts on this blog as well as future requests as they are brought to your attention. It has been our intention from the outset of our journey to Cambodia to coordinate efforts in providing humanitarian aid to the believers in this nation. We have intended to advance these efforts through the careful identification of needs and publication of those specific items in a forum which will provide opportunity for those whom God has impressed to give financially to give in an anonymous manner to fund specific projects with a degree of accountability and assurance that their funding is being used for the specified purpose. The precise method of these postings has not yet been finalized, however, the needs are already becoming apparent, so it is my intention to begin sharing some of the details of these needs/requests and to begin introducing you to the people and fellowships who have captured our hearts. The congregation at Varin is comprised weekly of between 65 and 100 individuals who are largely a very poor people. They live and work in a very underpriviledged rural community in the North East corner of Siem Reap Province. Their leader is Brother David Phean who returned to Cambodia after many years as a refugee in the USA and has labored tirelessly to bring the gospel to his home community and family members. Brother David was a member of the Cambodian armed forces in 1975 when the Khmer Rouge overthrew the government. David was marked for death, and by God’s grace was enabled to escape to Thailand with his family. As a direct result of his escape, his extended family were punished severely and his hometown was dealt with in a particularly harsh manner. Having been brought to faith in Christ while living in America, David made the decision to sacrifice his life in the USA including leaving behind 4 grown children and their families to return to ministry in Cambodia. David was able to purchase approximately 5 acres of land just outside of the town of Varin which he has dedicated to the church and the community of believers. He has specified that the land be utilized to provide training in agriculture and for the use of the church for a meeting place. When Elder Jamey Tucker and I first visited Varin, January, 2008, the land was little developed and the church had only begun meeting a short while before. We have witnessed a continual growth of the congregation both in numbers and in understanding as well as a continued improvement to the land and facilities. Brother David has on several occassions made known to us his plans/desires for the work, but has never directly requested funding or assistance in the performance of the work. He has personally overseen (and funded) the construction of a pastor’s residence, meeting house, and restroom facilities on the land, as well as the digging of two tanks for farming fish and the drilling of a well to provide water for the community. In September 2008, on our third visit to Cambodia, Brother Jamey and I were blessed to baptize 52 individuals from the Varin Fellowship upon profession of their faith in Christ and their belief in God’s sovereignty in salvation. The congregation has adopted the name, Varin Primitive Baptist Fellowship for their identity in their community. With all of the above introduction out of the way, Brother David has provided to us at our request a list of projects/needs that he has identified for the fellowship at Varin. We are sharing these requests in hopes that you will prayerfully consider contributing to the completion of these tasks which will make a tremendous difference in the lives of the believers in Varin and in impacting the community in a positive way opening doors for further ministry and proclamation of God’s word. In addition to the above list of financial needs, we desire your continual prayer for the people involved in the Varin Fellowship. As with any time that people begin to give themselves to the work of the ministry Satan stands waiting to attack and to discourage. The congregation at Varin has not been immune to these attacks. Men whom they have looked to as leaders have been revealed to be selfishly motivated and have departed from the faith. Financial and health crisis have struck at individual families in their number. Please pray that God will establish a sound and blameless ministry to preach His word in these communities and to lift up the hands of those who, like David, have labored to this point. My amazing and wonderful wife Rachel, along with our children suprised me with an early birthday dinner this evening. I was treated to a wonderful meal of Southern Fried Chicken, garlic mashed potatoes, gravy, Caeser salad, and apple pie a la mode. Who knows what is in store for tomorrow when the big day actually arrives. I don’t think anything could top this evening. (though I am secretly hoping for permission to buy a motorbike). Almost seems like home, sans air conditioning. To begin, I want to solicit your continued prayers for Beth as she continues to not feel well (in fact, her condition seems to have worsened rather than improved.) We took her back to the Royal Angkor International Hospital last evening where they ran more blood work and labs. She still has an infection, and in some ways seems to be worse than she was last week. They have changed the anti-biotic prescription and also added some additional supplementary instructions. She is scheduled for a follow-up appointment on Sunday afternoon. In spite of the difficulties associated with daily life, we have made some progress in the past week, and I rejoiced to finally have an opportunity to preach and minister on Saturday. 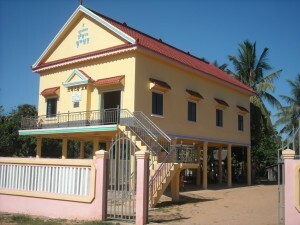 Early Saturday morning I left our home and travelled via taxi south on National Road 6 to the church at Sduk Sdom about 25km south of Kampong Thom to participate in a meeting of ministers for fasting and prayer. The minister’s and church leaders present were: Brother Kahn; Brother Lee; Brother Huen; Brother Chaan; Brother Tee (a young man from Viet Nam whom Elder Tucker and I first met in HoChiMinh City); Brother Muen; Brother Sopai. They were studying Daniel chapter 6 together during the morning session, and after 45 min of singing, each of the ministers shared a short message on the chapter before I presented a closing message. Then we shared prayer requests and needs from each of our lives and congregations before spending an hour in prayer. Top Right to Bottom Left: Dara, Kahn, Lee, Huen, Chaan, Tee, Muen, Sopai. For the afternoon session, we began with another song service which was followed by prayer for healing for a number of sick among the congregations. Then I spoke on the importance of the holy scriptures in establishing our faith and strengthening our relationship with Christ. For my texts I had them read: John 5:39, “Search the Scriptures; for in them ye think ye have eternal life: and they are they which testify of me.”; Galatians 3:24, “Wherefore the law was our schoolmaster to bring us unto Chris, that we might be justifed by faith.”; and Luke 24:25-27, “Then he said unto them, O fools, adn slow of heart to believe all that the prophets have spoken: Ought not Christ to have suffered these things, and to enter into his glory? And beginning at Moses and all the prohphets, he expounded unto them in all the scriptures the things concerning himself.” We then reviewed short examples from each book of the Old Testament where prophecy of Jesus Christ may be found and/or where God reveals what may be known of himself. The response was very positive, and afterward, we agreed upon a plan for the men and their wives to come and visit me for more personal instruction on a one or two day at a time for either one or two men. God willing, beginning next month we will have them come to visit in our home. After a closing prayer, I enjoyed a 30 km motorbike ride back to the bus station in Kampong Thom and from there returned by taxi to our home in Siem Reap. Sunday morning we once again held a worship service in our home with just our family in attendence. For the past two days, we have been preoccupied a bit with Beth’s illness, and I must confess we have all been a bit discouraged. We are, as always, thankful for each of your prayers and encouraging notes. We were finally able to track down our landlady and met with her yesterday. She has concocted a scheme for providing sufficient power to support both air conditioning units and has promised to have the solution in place by Friday of this week. I am sceptical to say the least. Today, Rachel made her first solo trip to the market and purchased additional kitchen utensils and some basic bamboo furniture (shelves and hat rack). Our friendship with Sokhom, the touk-touk driver, has continued to grow and we are steadily working together on language study. I am learning the Khmer alphabet, and Sokhom is building his English vocabulary and working on proper pronunciation. This morning, I did a small photo shoot with him in order to get a web site up and running for him. If you are ever in need of a touk-touk in which to visit the Angkor Wat area sites, please visit http://www.angkortours.biz. Who knows, if I am in a cash crunch I may ask Sokhom for a job. Thank you all again for your prayers. God Bless.